See the Toyota Sienna and take it for a test drive here at Lipton Toyota in Fort Lauderdale, FL. Tough, reliable, and proficient, the 2016 Sienna attracts a wide variety of families who are seeking a high-quality, spacious, and comfortable minivan. But that’s only some of the many compelling advantages that make the Sienna so distinguished. For 2016, upgraded multimedia elements offered include the recent Navigation Scout® GPS Link for Entune that employs the customer’s smartphone to source navigation through the head unit. And iPhone users will be eager to know that all available modules now incorporate the Siri® Eyes Free mode. Also, the Toyota Sienna’s awesome at saving fuel; terrific at hauling passengers; excellent at carrying cargo; and it's safe. 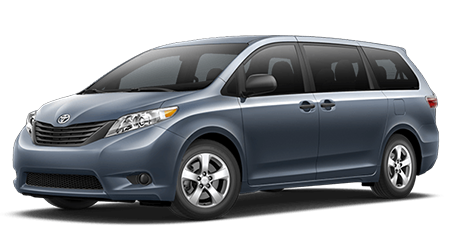 The Toyota Sienna continues to be the only edition offered with all-wheel drive. Our passionate and expert sales staff are standing by and ready to serve our neighbors from Dade County and Broward County, FL. With the Sienna SE, you add specific suspension tuning, a leather-trimmed steering wheel, LED taillights, and 19-inch wheels. The Sienna LE offers an expansion to the Entune audio system that features a center console, automatic climate control, sunshades for the rear seats, and a USB port. It also features, a power tailgate, power sliding side doors, Bluetooth with audio streaming power front seats, satellite radio, steering wheel phone and audio controls. The Entune connectivity adds Siri EyesFree and smartphone navigation. The Sienna XLE highlights a moonroof, leather upholstery, and heated front seats. At the top of the line, the Toyota Sienna Limited takes the XLE's features and showcases a folding third-row seat, second-row "lounge seats," an overhead console, a dual sunroof, a sliding center console, and JBL audio system. Note, the lounge seats and sliding console are no longer built-in to the all-wheel-drive models. Available options, depending on the trim include Toyota's 16.4-inch wide pair of screens, Dual View rear-seat DVD entertainment system, Blu-Ray, Entune mobile-app connectivity suite with DVD navigation, SD-Card compatibility, premium audio, and HDMI connection. A standard Tow Prep Package allows the Sienna pull a 3,500-pound trailer. Performance is robust, and the Sienna's independent suspension and electric steering and are arranged well to curb body roll. All Siennas include a 3.5-liter V6 motor that creates 266 horsepower, matched to a six-speed automatic transmission. This duo combination gives the Toyota Sienna assured energy for urban traveling and highway merging while using fuel efficiently. The front-wheel-drive 2016 Toyota Sienna garners 18 miles-per-gallon while in the city and 25 miles-per-gallon on the highway for a combined rating of 21 miles-per-gallon. The all-wheel drive rating comes in close by with estimates at 16 miles-per-gallon in the city and 23 miles-per-gallon along the highway for a shared rating of 19 miles-per-gallon. The 2016 Sienna has some of the most modern safety technology existing on the market. The standard Toyota Star Safety System™ equips the 2016 Toyota Sienna with Smart Stop Technology, Brake Assist, Enhanced Vehicle Stability Control, Traction Control, Electronic Brake-force Distribution, and Anti-lock Brakes. The Sienna is also outfitted with seat-mounted side airbags, a front passenger seat cushion airbag, driver’s side knee airbag, eight airbags, front airbags, and side curtain airbags. Front and rear parking sensors are standard on the Sienna Limited. Blind-spot monitors are standard on the XLE and Sienna Limited and available on the SE. They include cross-traffic alerts for backing out of parking spots more safely. A rearview camera is included on all models. An available Blind Spot Monitor with Rear Cross Traffic Alert on the Sienna SE, XLE, and Limited trims use wave radar designed to detect vehicles that are in your vehicle’s blind spot. Parent-pleasing and kid-friendly, 2016 Sienna offers a long list of safety features, multimedia technology, and great fuel efficiency. With plenty of room for the soccer team or a family camping trip, it’s a multitalented minivan. Check out the Toyota Sienna at Lipton Toyota located at 1700 West Oakland Park Blvd. in Fort Lauderdale, FL. You’ll get passionate customer service and our incredible price. Be one of the first in Dade County or Broward County, FL to own this handsome family-friendly vehicle.